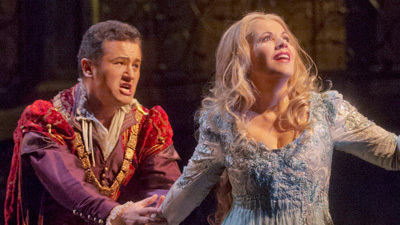 Since her 2013 debut as Magda in La Rondine, Kristine Opolais has become familiar to Met audiences in the works of Giacomo Puccini. In 2016, the soprano’s performances as the title heroine of Dvořák’s Rusalka allowed her to show off another of her signature roles. In a new production by Mary Zimmerman, this classic tale of a water sprite yearning to become a human to find love starts as a whimsical fairytale but quickly develops into a heartbreaking tragedy. On the podium, Sir Mark Elder leads a stirring account of Dvořák’s score, drawing a rich palette of musical colors from the Met Orchestra. Tenor Brandon Jovanovich gives a virile performance as the infatuated Prince, alongside bass Eric Owens as Rusalka’s father, the Water Gnome, and Jamie Barton as the devilish sorceress Ježibaba.